The Hunter Information & Training Program (HIT) is responsible for the administration of certification courses required to hunt in many parts of the state and other jurisdictions throughout North America. The HIT Program, with the assistance of over 400 volunteer instructors, offers quality training and education throughout Alaska. The certification courses offered include: hunter education, bowhunter education, crossbow education, and muzzleloader education. The HIT Program is also actively involved in outdoor education programs designed to recruit and retain new hunters into the shooting sports and preserve our hunter heritage. The Hunter Ed course provides training in firearms safety, wildlife conservation, and respect for our natural resources, landowners, and other hunters. The State of Alaska oversees three shooting ranges, each offering a variety of opportunities to the public. They are located in Anchorage, Juneau, and Fairbanks. Find a hunter ed, bowhunter ed, crossbow ed, or muzzleloader ed certification class in your area. The Bowhunter Education course provides training in wildlife conservation, bowhunting techniques and safety, and outdoor preparedness. This certification course is endorsed by the IBEP/NBEF. The Hunter Clinic series offers Alaskan hunters the opportunity to gain new hunting and shooting sports skills or sharpen existing skills. Do you enjoy mentoring children and others in firearms safety? HIT volunteer instructors assist in developing safe Alaskan hunters, improving hunter ethics and responsibility, and passing on a valuable tradition to thousands of new outdoor enthusiasts. The Muzzleloader Education course provides "hands-on" instruction on safe handling of black powder, black powder substitutes, and muzzleloaders at the range and in the field This course is required for all hunters who apply for and/or hunt in “Muzzleloader Only” hunts. The Becoming an Outdoors Woman (BOW) Program offers hands-on workshops that teach adult women outdoor skills while building their confidence and ability to get out and safely enjoy all that Alaska has to offer. The HIT Program is heavily involved with youth conservation and shooting programs, including: National Archery in the Schools (NASP), Youth Shotgun League, and Outdoor Youth Days day camp. 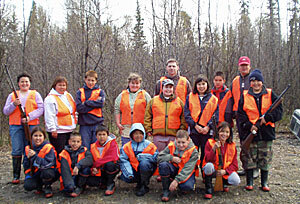 The Crossbow Education course provides instruction on crossbow techniques and safety, wildlife conservation, and outdoor preparedness.